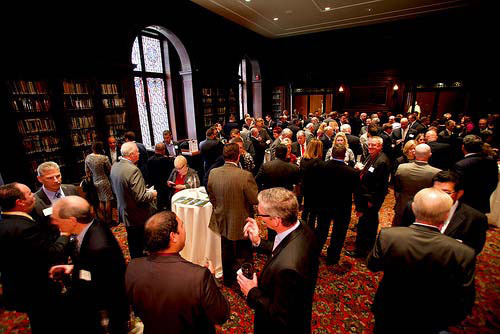 Friday, October 28th, marked a very special day for the Chilean & American Chamber of Commerce of Greater Philadelphia. 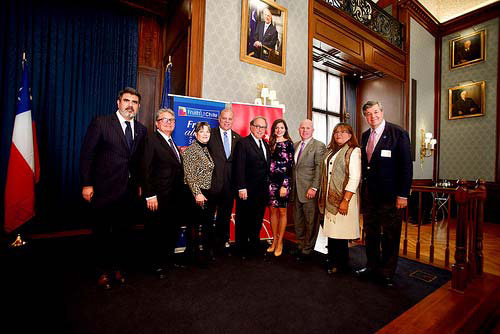 Philadelphia was chosen as the final stop for Chile Week USA, an important delegation of political and business leaders from Chile's public and private sectors who spent five days in Philadelphia, Miami, and New York City during the last week of October. 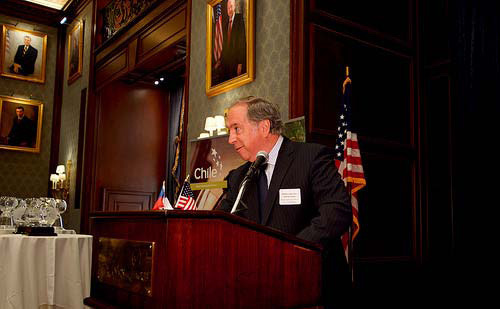 Members, friends, honorees, and the special Chilean Delegation gathered in the Lincoln Memorial Room of the historic Union League of Philadelphia to kick off the 19th Annual Friend of Chile Awards Luncheon with a refreshing Chilean wine reception. Chilean Cabernet Sauvignon from the Maipo Valley and Sauvignon Blanc from the Leyda Valley were generously provided by Santa Carolina Winery and Wines of Chile USA. Vina Santa Carolina, originally founded in 1875, is currently Chile's third largest wine brand and winner of Wine Enthusiast’s 2015 New World Winery of the Year. The Chilean & American Chamber of Commerce was fortunate to host special guests from Chile, including His Excellency, Juan Gabriel Valdes, Ambassador of Chile to the United States and Ronald Bown F., Chairman of the Board of the Chilean Fruit Exporters Association. Both leaders gave remarks that emphasized the importance of the relationship between the Greater Philadelphia Region and the United States. 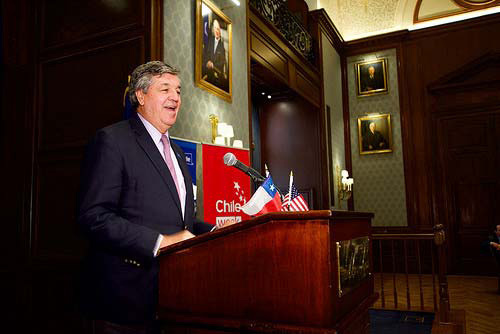 Ambassador Valdes, who has partnered with the Chilean & American Chamber of Commerce for a multitude of events in 2016, described the acute location of our region's ports, highlighting that the 11-county area is one day’s drive from 70 percent of the U.S. population. This, coupled with the fact that Philadelphia is one of the most cost-effective urban areas in the country, makes the Delaware River ports the most efficient partner for Chile's exports. 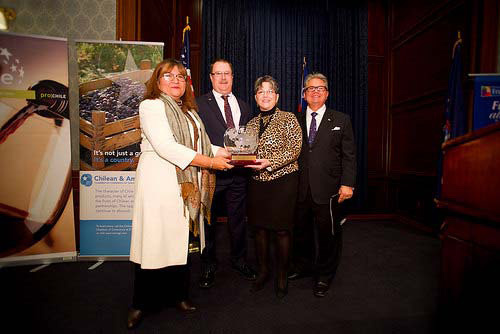 Following Ambassador Valdes, Miriam Borja-Fisher and Kurt Reichert of Western Fumigation took the stage to formally present their longtime colleague, Barbara Hunter of BHA Consults, LLC, with the 2016 Lifetime Achievement Award. Hunter, who received the Friend of Chile Award 16 years ago, has long been an advocate for the Chilean fruit business in the Delaware River Port Community. Some of her accomplishments include the creation of The Food Safety and Security Program for port terminals, serving as Director and member of the Maritime Exchange for the Delaware River and Bay's Executive Committee, and her current role in serving as an active member of both the CBP-AG Working Group and the USDA Treatment Fee Task Force. Hunter attributed her dedication to her profession to the dynamic Chilean business culture, remarking that “working with Chile is never boring." Immediately after Bowns' award presentation, Palaima returned to the podium to introduce Leo Holt, President of Holt Logistics Corp. and Visionary Sponsor of the luncheon, to formally present the 19th Annual Friend of Chile Award to Senator Stephen Sweeney. Holt reminisced of days when Senator Sweeney, current Vice President of the International Association of Iron Workers, and his father worked through extreme conditions to build the infrastructure of Gloucester Marine Terminal, which has served as a point of entry for many hundreds of millions of boxes of fresh Chilean fruit and other products over many decades. 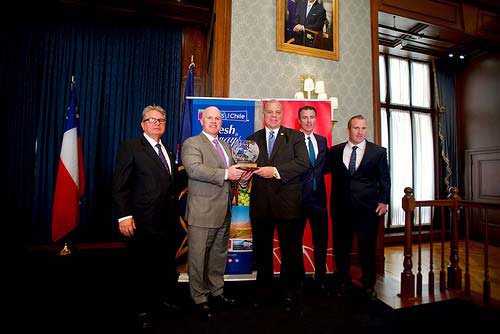 Senator Sweeney, the Senate President of New Jersey and representative of the state's Third Legislative District since 2002, accepted the award with great thanks to the Chilean & American Chamber of Commerce. He devoted his hard work in Gloucester to creating jobs and supporting the port industry—two things he has always been an advocate for. The Chilean & American Chamber of Commerce's 19th Annual Friend of Chile Awards Luncheon would not have been possible without the support of many generous sponsors including ASOEX and ProChile, the Presenting Partners of the luncheon; Holt Logistics Corp., the Visionary Sponsor of the event; Presenting Sponsors Philadelphia Regional Port Authority, The Port of Wilmington, Delaware, Tastyfrutti International, Inc., and Western Fumigation; Wines of Chile and Santa Carolina, the wine sponsors for all of the Chilean & American Chamber's Chile Week events; and Corporate Table Sponsors Dayka & Hackett LLC, Delaware River Stevedores, Inc., GEODIS USA, Inc., Giumarra International Marketing, J&K Fresh East, div. of 721 Logistics, Manfredi Cold Storage & Distribution, Mattioni, Ltd., Murphy Marine Services, Inc., Ports of Delaware River Marine Trade Association, RPS / Royal Fumigation, Sbrocco International Inc., and William H. Kopke, Jr., Inc. The CACC's collaboration with Chile Week USA was proudly featured in Metro Philly, The Packer, and Philadelphia Business Journal.